Share the post "Treatment for Heavy Periods"
Dealing with heavy bleeding and looking for a solution? Learn about various types of treatments and how UAE may also help put an end to your bloody misery. What are some of the treatment options for heavy bleeding or pain? Nonsteriodal anti-inflammatory drug (NSAID) therapy can improve menstrual cramping and reduce bleeding. However, there is no evidence thus far that confirms whether this medication is capable of relieving pain or bleeding specifically caused by fibroids. Birth control hormones, whether it be the pill, patch or the ring, can lighten periods and pain while also preventing pregnancy. Intrauterine devices change the lining of the uterus by releasing small amounts of a hormone, rendering the sperm incapable of joining with the egg. In this process, this device also may reduce heavy bleeding. The progestin shot, also called Depo-Provera, can be taken every 3 months and may lighten bleeding. It also prevents pregnancy. Based on different studies, progestin may improve fibroids or may make them grow-results vary from among women. Lastly, iron supplements are an important aspect of correcting anemia which can be caused by blood loss from fibroids. If a patient suspects that they are experiencing heavy blood loss due to fibroids, please reach out to your physician or give the Fibroid Treatment Collective a call at 866-362-6463. By calling this number, you are eligible to receive a free, one-on-one consultation with Dr. Bruce McLucas. 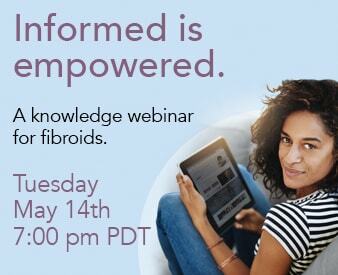 Also, make sure to keep an eye out for the on-going fibroid seminar and webinars hosted frequently by Dr. McLucas.